Finally, Friday. Thanks for taking your sweet time. Here’s a rich purple arrangement to send you off on your weekend. Make the best of it, my friends. Anemones, calas, hyacinth, viburnum, and privet berries. This entry was posted on Friday, January 14th, 2011 at 1:20 pm	and tagged with anemones, blue viburnum berries, cala, deep purple, hyacinth, privet berries and posted in Portfolio. You can follow any responses to this entry through the RSS 2.0 feed. 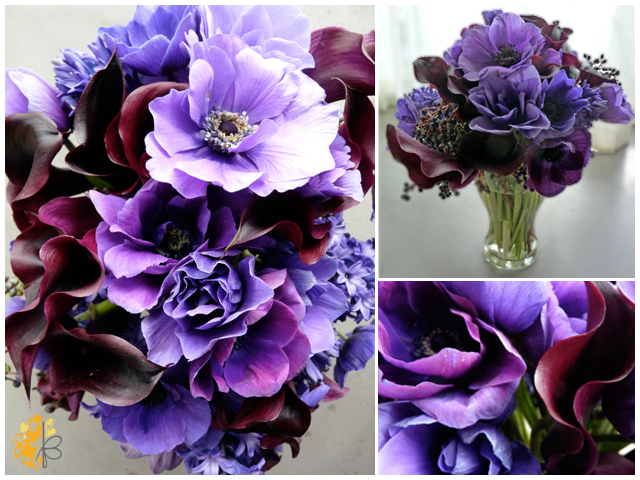 Beautiful arrangement…love the rich purple hues. The Calas are the burgundy looking ones right, just beautiful! So talented you are 🙂 HAPPY FRIDAY!